To run the tool, Java JDK7 or the corresponding JRE must be installed properly on your computer. You can get the latest Java version right here. To install GridLife, simply download the zip-file and decompress it to any harddrive location. 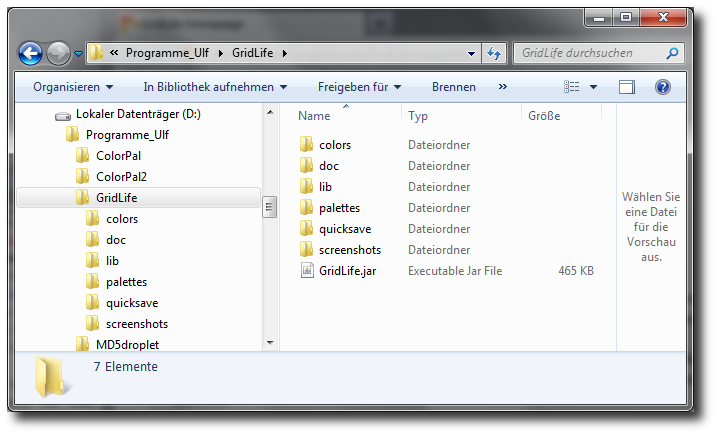 You can start GridLife by double-clicking the file GridLife.jar in the installation directory. You may also want to create a link/shortcut executing javaw -jar <installation directory>/GridLife.jar to get rid of a start shell window. In this case, please make sure that the execution directory is the installation directory (see below), so that GridLife can find the files for settings and color palettes. The previous image shows what your GridLife directory should look like after decompressing the archive. In this example, the zip-file has been extracted to the folder D:\Programme_Ulf. Since the zip-file contains a complete subdirectory called GridLife, the resulting installation directory in this case is D:\Programme_Ulf\GridLife.